In some cases the isolation and characterization of the pyrrolo[1,2-a]quinazolinone derivatives was possible and thus such compounds could be characterized. New bismaleimide-based polyaspartimides: thermal, dielectric and morphological properties, M. SAVA, I. STOICA,. M. NECHIFOR and V. E. MUSTEATA . SUPRAMOLECULAR COPPER(II) DIMERS RESULTED FROM HYDROGEN ... a perchlorate oxygen (1) or a thiocyanate sulfur/nitrogen atom (2) in the apical. revue roumaine de geologie geophvsioue. removed by azeotropic distillation. ... in water. The elemental analysis of the newly obtained compounds ..... solutions in DMF of 1 mg/mL concentration. “Land”-type spatial entities are extremely well-outlined in Romania through a complex of favourable factors. (natural, historical ... [email protected] . cMTA-BME Research Group of Technical Analytical Chemistry, Szt Gellert ter 4, H-1111 Budapest, Hungary. Received December .... Douglas A. Skoog et al. in âFundamentals of. Analytical ... the book, has been used, but without the limitation. Heavy metals are increasingly present in industrial wastes and effluents, which can generate serious concerns for environmental quality and human health. Consequently, there is a continuous expansion of researches for new approaches and developments to guarantee environmental cleaning-up. Although there are some physico-chemical established methods for the removal of heavy metals from various environmental compartments, biosorption gains further confidence as a reliable alternative compared to classical technologies, which are expensive and sometimes unreliable. This paper aims to analyze the biosorption as a biotechnological strategy for the decontamination of aqueous effluents containing heavy metal ions, in terms of its potential for metal immobilization and uptake. The paper also focuses on the most important parameters affecting the removal of heavy metals by various categories of biosorbents – both living and non-living forms of biomass – and provides new alternatives for modeling and optimization of process equilibrium and kinetics. A special attention was paid to biosorption mechanism, as a factual challenge for process optimization and scale-up. 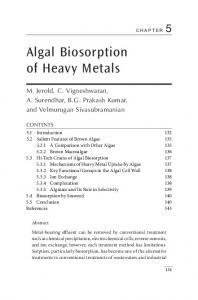 The potential benefits and problems associated to metal removal by biosorption are highlighted. Raluca Maria Hlihor et al. 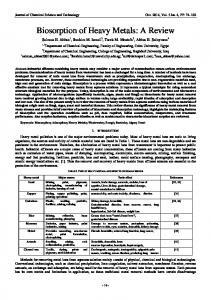 functional groups such as acetamido, alcoholic, carbonyl, phenolic, amido, amino and sulphydryl groups present in agricultural waste biomass form metal complexes or chelates with heavy metal ions.36 Table 1 presents a short summary on several types of lignocellulosic materials applied for the removal of heavy metals from wastewaters. most effective solutions for heavy metals removal from the environment. Table 3 summarizes the results of several studies on heavy metals removal from aqueous solutions by different types of algal biomass in batch system. Usually, in literature, it is considered that the biosorption process can often occur under the following conditions:71-72 (a) in a certain interval, the temperature can have a negative or positive effect on biosorption; (b) the pH of solution is a very important parameter of the process, since it influences the metal chemical speciation and solubility, the activity of biomass functional groups (active sites), and the metallic ion competition for active sites; (c) in diluted solutions, the biomass concentration influences the biosorption capacity: at lower concentrations, there is an increase in the biosorption capacity; (d) in solutions with different metallic species there is a competition among metals to occupy active sites. In the work of Bulgariu et al.,44 nickel(II) removal from aqueous solution onto peat moss was studied as a function of its initial concentration, under optimum conditions. The authors observed that a good efficiency of nickel(II) removal is obtained at a relative low concentration (below 90 mg/L), when nickel(II) concentration from residual solutions is lower than the permissible limits, making the peat moss an efficient adsorbent for wastewater treatment. For example, some preliminary studies performed in our group on Cd(II) biosorption by different agricultural wastes revealed that nutshells have a higher removal capacity when compared with pumpkin seed hulls, bean hulls and straws (Fig. 1). Fig. 1 – Biosorbent type influence on Cd(II) uptake (a) and on process efficiency R (%) (b) (50 mg/L Cd(II), 5 g/L biosorbent dosage, pH 6, PSH-Pumpkin seed hulls, BH-Bean hulls, S- straws, NS-nutshells). where V is the volume of the solution (L) and m is the mass of dead biomass (g). MODELING AND SIMULATION TOOLS FOR BIOSORPTION OF HEAVY METALS The equilibrium data of heavy metal biosorption are represented by different modeling approaches. Different adsorption equilibrium and kinetic models are extensively used in elucidating the biosorption of heavy metals, indicating the need to highlight and summarize their essential issues.17, 74 Isotherms modeling Biosorption equilibrium is the basic requirement for designing a biosorption system. Linear regression is frequently used for the determination of the bestfitting sorption isotherm, while the method of least squares is applied for finding the parameters of the isotherms. Since the transfer of substances from a mobile phase (liquid or gaseous) to a solid phase is a universal phenomenon, the “isotherm” – a curve describing the retention of a substance on a solid at various concentrations, is a major tool to describe and predict the mobility of metal ions in aqueous solutions. These retention/release phenomena are sometimes strongly kinetically controlled, so that time-dependence of the sorption isotherm must be specified.75 The adsorption equilibrium determines:76 1. the amount of species adsorbed under a given set of conditions (concentration and temperature), or 2. how selective retention takes place when two or more absorbable components coexist. The equilibrium distribution of metal ions between the biosorbent and the solution is important in determining the maximum biosorption capacity. Several isotherm models are available in the literature to describe the equilibrium biosorption distribution and the probable mechanism of the sorption process. Some of the most applied isotherm models in biosorption studies, Langmuir isotherm and Freundlich model, are summarized as the best fitting isotherms, in Table 4. The linear representations of Langmuir model applied for the removal of Cd(II) ions onto mustard biomass and alkaline treated mustard biomass is presented in the work of Bulgariu et al.37 The authors indicated that the value of correlation coefficient (R2) was higher in the case of Langmuir model than for Freundlich model, meaning that both untreated and alkaline treated mustard biomass surfaces are up of homogeneous sorption patches, demonstrating the formation of monolayer coverage of Cd(II) ions on the outersurface of the biosorbent. where: qe and qt (mg/g) are the sorption capacity at equilibrium and at time t (min), respectively and k1 is the rate constant of the pseudo-first order equation (min-1). k2 is the rate constant of pseudo-second order sorption (g/mg min). time and the number of experiments necessary to carry out a complete adsorption study.86-87 Another optimization tool applied with success for wastewater treatment is represented by genetic algorithms (GAs), which have the capability to find a global optimum with no piece of information in the search area other than an objective function that assigns a value to any solution.87-88 Suditu et al.87 successfully applied the artificial intelligence method based on neural network models and genetic optimization algorithms for the removal of cadmium, cobalt, nickel, mercury, and copper from wastewaters by peat from Poiana Stampei, Romania. In the study of Singha et al.89 the ANN with a single hidden layer trained with Levenberg-Marquardt algorithm predicted the percentage removal of Cr(VI) ions from aqueous solution accurately. The maximum removal of Cr(VI) ions by eight different biosorbents considering different operating parameters was studied to optimize the conditions for the biosorption process. Kardam et al.90 developed a two-layer ANN model to predict the removal efficiency of Cd(II) ions from aqueous solution using shelled Moringa Oleifera seed (SMOS) powder by combining back propagation (BP) with principle component analysis. The ANN technique was applied by Gamze Turan et al.,91 for the prediction of adsorption efficiency for the removal of Zn(II) ions from leachate by hazelnut shell. A comparison between the model results and experimental data gave a high correlation coefficient and showed that the model is able to predict the removal of Zn(II) from leachate. The removal of total chromium from aqueous solution by Bacillus sp. was modeled by ANN technique based on 360 data sets obtained in a laboratory batch study by Masood et al.92 Their researches showed that the ANN model had reasonable predictive performance (R2 = 0.971) of chromium biosorption. Response Surface Methodology (RSM), which is a combination of mathematical and statistical techniques used for developing, improving and optimizing processes, has been also emphasized in recent years in the field of biosorption of heavy metals.93-95 An extensive review that describes the use of response surface methodology (RSM) and artificial neural networks (ANN) in biosorption modeling and optimization was developed by Witek-Krowiak et al.96 The authors discuss the limitations and application of these techniques in biosorption modeling and optimization and showed that these methodologies are especially useful in modeling and optimization. Fig. 2 – Biosorption mechanisms categorized based on cellular metabolism and location of biosorption (adapted after Gaur et al.106 and Gavrilescu17). CONCLUSIONS AND RECOMMENDATIONS Future trends in biosorption will take into consideration the identification of better and more selective biosorbents, new directions for modeling and optimization of the process in order to a better understanding of the metal-biomass interactions, as well as for process scale-up. Taking into account the high variety of proposed biosorbents, further assessments on market size, costs of development and commercialization of biosorption as an optimum bioremediation technology are highly expected. A better understanding of metal-biomass interactions should open the possibility for mechanisms elucidation. A frequently asked common question involves the fate of the metal loaded biomass after the biosorption process. The common answer to the disposal of the final material is via landfill or incineration. Even if the biosorbent can be efficiently reused over several cycles, the final disposal of the material should be addressed. However, due to the increasing levels of landfill tax, and the potential restrictions due to contamination of ground waters, the landfill option has become less attractive. A variety of investigations clearly demonstrated that biosorption is a useful option to conventional treatment systems for the removal of heavy metals from aqueous solutions. Acknowledgements: This paper was elaborated with the support of a grant of the Roumanian National Authority for Scientific Research, CNCS – UEFISCDI, project number PNII-ID-PCE-2011-3-0559”, Contract 265/2011. D. Sobariu is grateful to Sciex-NMS-CH for supporting her PhD grant. A. Abdolali, W. S. Guo, H. H. Ngo, S. S. Chen, N. C. Nguyen and K. L. Tung, Bioresour. Technol., 2014, 160, 57. F.A. Caliman, B.M. Robu, C. Smaranda, V.L. Pavel and M. Gavrilescu, Clean Technol. Environ. Policy, 2011, 13, 241. M. Gavrilescu and Y. Chisti, Biotech. Adv., 2005, 23, 471. J. Wang and C. Chen, Bioresour. Technol., 2014, 160, 129. R.M. Hlihor, L.C. Apostol, V.L. Pavel, C. Smaranda, B. Robu, F.A. Caliman and M. Gavrilescu, Bulletin of the Polytechnic Institute of Iassy, Section Chemistry and Chemical Engineering, 2009, LV, 19. U. Farooq, J.A. Kozinski, M. Ain Khan and M. Athar, Bioresour. Technol., 2010, 101, 5043. R. Dhankhar and A. Hooda, Environ. Technol., 2011, 32, 467. K. Karlsson, M. Viklander, L. Scholes and M. Revitt, J. Haz. Mat., 2010, 178, 612. V. L. Pavel, D. L. Sobariu, M. Diaconu, F. Statescu and M. Gavrilescu, Environ. Eng. Manag. J., 2013, 12, 727. V. L. Pavel, M. Diaconu, D. Bulgariu, F. Statescu and M. Gavrilescu, Environ. Eng. Manag. J., 2012, 11, 165. R.M. 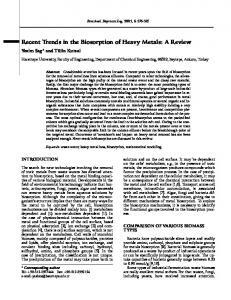 Hlihor, M. Diaconu, H. Figueiredo, T. Tavares and M. Gavrilescu, Proceedings of the 3rd International Conference on Advanced Materials and Systems, 2010, 387. M. Fomina and G.M. Gadd, Bioresour. Technol., 2014, 160, 3. J. He and J.P. Chen, Bioresour. Technol., 2014, 160, 67. S. L. Narges, Rev. Roum. Chim., 2013, 58, 43. N. I. Abdulla, A. M. A. Al-Haidary, M. I. Al-Jeboori, F. H. H. Zanganah, S. R. F. Al-Azawi and A. H. Al-Dujaili, Environ. Eng. Manag. J., 2013, 12, 483. 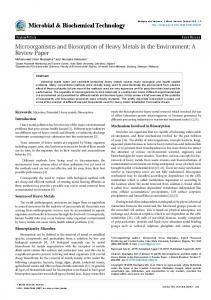 Biosorption of heavy metals 16. G. Crini, Bioresour. Technol., 2006, 97, 1061. 17. M. Gavrilescu, Eng. Life Sci., 2004, 4, 219. 18. N. Fiol, J. Serarols, J. Poch, M. Martínez, N. Miralles and I. Villaescusa, “Low cost materials for metal uptake from aqueous solutions”, In: “Environmental Chemistry: Green Chemistry and Pollutants in Ecosystems”, E. Lichtfouse, J. Schwarzbauer and D. Robert (Eds. ), Springer, 2005, p. 251-258. 19. I. Michalak, K. Chojnacka and A. Witek-Krowiak, Appl. Biochem. Biotechnol., 2013, 170, 1389. 20. M. Gavrilescu, “Biosorption in environmental remediation”, In: “Bioremediation Technology-Recent Advances”, M. H. Fulekar (Ed. ), Springer Netherlands, 2010, p. 35-99. 21. M. Gavrilescu, Dynamic Biochemistry, Process Biotechnology and Molecular Biology, 2010, 4, 1. 22. R. L. Babu, E. Vijayalakshmi, M. Naveen Kumar, R. H. Patil, K. S. Devaraju and S. Chidananda Sharma, Biorem. J., 2013, 17, 231. 23. D. I. Tudorache Fertu and M. Gavrilescu, Environ. Eng. Manag. J., 2012, 4, 867. 24. J. Wang and C. Chen, Biotechnol. Adv., 2006, 24, 427. 25. R. Sen and S. Chakrabarti, Curr. Sci., 2009, 97, 768. 26. R.M. Hlihor and M. Gavrilescu, Bulletin of the Polytechnic Institute of Iassy, Section Chemistry and Chemical Engineering, 2009, LV, 21. 27. T. Tavares and H. Figueiredo, “Biosorption of Heavy Metals – New Perspectives”, In: “Bioremediation and Sustainability: Research and Applications”, R. Mohee and A. Mudhoo (Eds. ), John Wiley & Sons, Inc., Hoboken, NJ, USA, 2012, p. 261-284. 28. H. Rezaei, Arab. J. 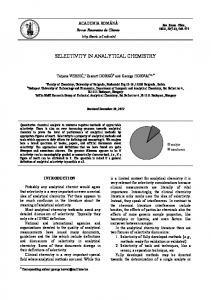 Chem., 2013, http://dx.doi.org/10.1016/j.arabjc.2013.11.008. 29. D. Shukla and P. S. Vankar, “Role of Trichoderma Species in Bioremediation Process: Biosorption Studies on Hexavalent Chromium”, In: “Biotechnology and Biology of Trichoderma”, V. K. Gupta, M. Schmoll, A. Herrera-Estrella, R. S. Upadhyay, I. Druzhinina, M. Tuohy (Eds. 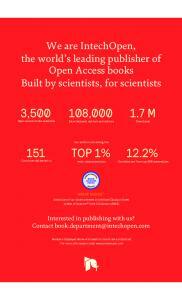 ), Elsevier, 2014, p. 405-412. 30. K. Vijayaraghavan and U. M. Joshi, Biorem. J., 2012, 16, 225. 31. R. M. Hlihor and M. Gavrilescu, Environ. Eng. Manag. J., 2009, 8, 353. 32. I. Cretescu, M. Diaconu, C. Cojocaru, R. E. Benchea and C. Pohontu, Environ. Eng. Manag. J., 2010, 9, 107. 33. P. E. Dobrovici, A. I. Simion, C. G. Grigoraş and L. Favier-Teodorescu, Rev. Roum. Chim., 2013, 58, 517. 34. H.-J. Lee, B.-G. Lee, D.-Y. Shin and H. Park, Mater. Sci. Forum., 2008, 569, 285. 35. D. Lucaci, M. Visa, A. Duta, Environ. Eng. Manag. J., 2011, 10, 169. 36. M.A. Hashim, S. Mukhopadhyay, J. N. Sahu and B. Sengupta, J. Environ. Manage., 2011, 92, 2355. 37. L. Bulgariu, R.M. Hlihor, D. Bulgariu and M. Gavrilescu, Environ. Eng. Manag. J., 2012, 11, 1969. 38. B. Mesci, Environ. Eng. Manag. J., 2013, 12, 2289. 39. A. Witek-Krowiak, Environ. Eng. Manag. J., 2013, 12, 2125. 40. S. Aber, B. Ayoubi-Feiz and D. Salari, Environ. Eng. Manag. J., 2013, 12, 435. 41. C. Balan, I. Volf, P. Bulai, D. Bilba and M. Macoveanu, Environ. Eng. Manag. J., 2012, 11, 21. 42. S. T. Ramesh, R. Gandhimathi, N. Badabhagni and P. V. Nidheesh, Environ. Eng. Manag. J., 2011, 10, 1667. 43. P. SenthilKumar, V. R. Sathyaselvabala, D. Selvaraj, P. Vijayalakshmi and S. Sivanesan, Environ. Eng. Manag. J., 2011, 10, 285. 44. L. Bulgariu, D. Bulgariu and M. Macoveanu, Environ. Eng. Manag. J., 2010, 9, 667. 45. A. Kicsi, D. Bilba and M. Macoveanu, Environ. Eng. Manag. J., 2010, 9, 341. 46. P. Senthilkumar and R. Gayathri, Environ. Eng. Manag. J., 2010, 9, 429. 47. G. Blázquez, M. A. Martín-Lara, G. Tenorio and M. Calero, Chem. Eng. J., 2011, 168, 170. 48. S. S. Ahluwalia and D. Goyal, Biorem. J., 2013, 17, 190. 49. K. S. Prasad, P. Srivastava, V. Subramanian and J. Paul, Separ. Sci. Technol., 2011, 46, 2517. 50. X. Xu, L. Xia, Q. Huang, J.-D. Gu and W. Chen, Environ. Technol., 2012, 33, 1661. 51. F. Masood and A. Malik, J. Environ. Sci. Health A. Tox. Hazard. Subst. Environ. Eng., 2011, 46, 1667. 52. R.M. Hlihor, M. Diaconu, D. Fertu, C. Chelaru, I. Sandu, T. Tavares and M. Gavrilescu, Int. J. Environ. Res., 2013, 7, 581. 53. R.M. Hlihor, M. Diaconu, M. Gavrilescu, Bulletin of the Polytechnic Institute of Jassy, Section Chemistry and Chemical Engineering, 2011, LVII, 163. 54. S. Murugavelh and K. Mohanty, Environ. Eng. Manag. J., 2014, 13, 281. 55. I. J. Puentes-Cárdenas, A. M. Pedroza-Rodríguez, M. Navarrete-López, T. L. Villegas-Garrido and E. CristianiUrbina, Environ. Eng. Manag. J., 2012, 11, 1741. 56. A. B. Karaduman, M. Yamaç, Z. Pat, M. J. Amoroso and S. A. Cuozzo, Environ. Eng. Manag. J., 2011, 10, 1761. 57. Y. Zhang, Y. Dai, B. Liu, F. Ma, R. Zheng and L. Dong, Environ. Eng. Manag. J., 2011, 10, 729. 58. R. Tabaraki, S. Ahmady-Asbchin and O. Abdi, Journal of Environmental Chemical Engineering, 2013, 1, 604. 59. M. F. Ahmad, S. Haydar and T. A. Quraishi, Int. Biodeter. Biodegr., 2013, 83, 119. 60. B. Nagy, C. Mânzatu, A. Măicăneanu, C. Indolean, L. Barbu-Tudoran and C. Majdik, Arabian J. Chem., 2014, http://dx.doi.org/10.1016/j.arabjc.2014.03.004. 61. A. A. Al-Homaidan, H. J. Al-Houri, A. A. Al-Hazzani, G. Elgaaly and N. M.S. Moubayed, Arabian J. Chem., 2014, 7, 57. 62. L. Brinza, M.J. Dring and M, Gavrilescu, Environ. Eng. Manag. J., 2005, 6, 237. 63. F. Fu and Q. Wang, J. Environ. Manage., 2011, 92, 407. 64. N. Koutahzadeh, E. Daneshvar, M. Kousha, M.S. Sohrabi and A. Bhatnagar, Desalin. Water Treat., 2013, 51, 6021. 65. L. Brinza, C.A. Nygård, M.J. Dring, M. Gavrilescu and L.G. Benning, Bioresour. Technol., 2009, 100, 1727. 66. M. Lupea, L. Bulgariu, M. Macoveanu, Environ. Eng. Manag. J., 2012, 11, 607. 67. D. Bulgariu and L. Bulgariu, Bioresour. Technol., 2012, 103, 489. 68. A. M. Abdel -Aty, N. S. Ammar, H. H. Abdel and R. K. Ali, J. Adv. Res., 2013, 4, 367. 69. R. Flouty and G. Estephane, J. Environ. Manage., 2012, 111, 106. 70. I. M. Dittert, H. de Lima Brandão, F. Pina, E. A.B. da Silva, S. M. A. G. U. de Souza, A. A. U. de Souza, C. M. S. Botelho, R. A. R. Boaventura and V. J. P. Vilar, Chem. Eng. J., 2014, 237, 443. 71. R. C. Oliveira, M. C. Palmieri and O. Garcia Jr., “Biosorption of Metals: State of the art, general features, and potential applications for environmental and technological processes”, In: “Progress in biomass and bioenergy production”, S.S. Shankat (Ed. ), InTech Publisher, 2011, p. 151-176. 72. R.M. Hlihor, “Sorption processes applied for the removal of heavy metals from contaminated environments”, PhD thesis, 2011, Gheorghe Asachi Technical University of Iaşi, Iaşi, Roumania. 73. A. Şeker, T. Shahwan, A.E. Eroğlu, S. Yılmaz, Z. Demirel, M.C. Dalay, J. Hazard. Mater., 2008, 154, 973. 74. F. Pagnanelli, “Equilibrium, kinetic and dynamic modelling of biosorption processes”, In: “Microbial Biosorption of Metals”, P. Kotrba, M. Mackova, T. Macek (Eds. ), Springer, 2011, p. 59-120. 75. G. Limousin, L. Charlet, S. Szenknect, M. Krimissa and V. Barthe, Appl. Geochem., 2007, 22, 249. 76. J.C. Igwe and A.A. Abia, Afr. J. Biotechnol., 2006, 5, 1167. 77. L. Bulgariu, M. Lupea, D. Bulgariu, Rusu and M. Macoveanu, Environ. Eng. Manag. J., 2013, 12, 183. 78. M. Jain, V. K. Garg and K. Kadirvelu, Biorem. J., 2013, 17, 30. 79. K. S. Prasad, A. L. Ramanathan, Jaishree Paul, V. Subramanian and R. Prasad, Environ. Technol., 2013, 34, 2701. 80. R. B. Nessim, A. R. Bassiouny, H. R. Zaki, K. M. Kandeel, M. N. Moawad and K. M. Kandeel, Chem. Ecol., 2011, 27, 579. 81. Y.-S. Ho, Water Res., 2006, 40, 119. 82. R. M. Hlihor, M. Diaconu, F. Leon, S. Curteanu, T. Tavares, M. Gavrilescu, New Biotech., 2014, http://dx.doi.org/10.1016/j.nbt.2014.08.003. 83. Y. H. Li, Q. Du, X. Peng, D. Wang, Z. Wang, Y. Xia and B. Wei, Colloids Surf. B, 2011, 85, 316. 84. A. Polat and S. Aslan, J. Environ. Eng. Landsc., 2014, 22, 132. 85. R. Namdeti and K. Pulipati, Desalin. Water Treat., 2014, 52, 339. 86. G. D. Suditu, S. Curteanu and L. Bulgariu, J. Environ. Sci. Health A. Tox. Hazard. Subst. Environ. Eng., 2013, 48, 1399. 87. G. D. Suditu, C. G. Piuleac, L. Bulgariu and S. Curteanu, Environ. Eng. Manag. J., 2013, 12, 167. 88. E. N. Dragoi, G. D. Suditu and S. Curteanu, Environ. Eng. Manag. J., 2012, 11, 1907. 89. B. Singha, N. Bar, S. K. Das, Desalin. Water Treat., 2014, 52, 415. 90. A. Kardam, K. Rohit Raj,, J. Kumar Arora, M. Mohan Srivastava and S. Srivastava, J. Water Resource and Protection, 2010, 2, 339. 91. N. Gamze Turan, B. Mesci and O. Ozgonenel, Chem. Eng. J., 2011, 173, 98. 92. F. Masood, M. Ahmad, M. A. Ansari and A. Malik, Bull. Environ. Contam. Toxicol., 2012, 88, 563. 93. M. Jain, V.K. Garg and K. Kadirvelu, Bioresour. Technol., 2011, 102, 600. 94. M. Sarkar and P. Majumdar, Chem. Eng. J., 2011, 175, 376. 95. B. Kiran and K. Thanasekaran, Int. Biodeterior. Biodegrad., 2011, 65, 840. 96. A. Witek-Krowiak, K. Chojnacka, D. Podstawczyk, A. Dawiec and K. Pokomed, Bioresour. Technol., 2014, 160, 150. 97. G.M. Gadd, J. Chem. Technol. Biot., 2009, 84, 13. 98. 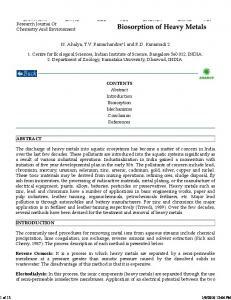 M. Jayaraman and R. Arumugam, International Journal of Science and Research, 2014, 3, 335. 99. J. Joshi and O. Sahu, Journal of Applied & Environmental Microbiology, 2014, 2, 23. 100. F. Ogata, M. Kangawa, Y. Iwata, A. Ueda, Y. Tanaka and N. Kawasaki, Chem. Pharm. Bull., 2014, 62, 247. 101. P. Sarwa and S. K. Verma, Clean - Soil, Air, Water, 2014, 42, 1298. 102. H.K. Alluri, S.R. Ronda, V.S. Settalluri, J. Singh, V. Suryanarayana and P. Venkateshwar, Afr. J. Biotechnol., 2007, 6, 2924. 103. J.G. Ibanez, M. Hemandez-Esparza, C. Doria-Serrano and A. Fregoso-Infante, “Environmental Chemistry: Fundamentals”, Springer, 2007. 104. G. Naja and B. Volesky, “The mechanism of metal cation and anion biosorption”, In: “Microbial Biosorption of Metals”, P. Kotrba, M. Mackova and T. Macek (Eds. ), Springer, 2005, p. 19-58. 105. P. Kotrba, “Microbial biosorption of metals - General Introduction”, In: “Microbial Biosorption of Metals”, P. Kotrba, M. Mackova and T. Macek (Eds. ), Springer, 2011, p. 1-6. 106. N. Gaur, G. Flora, M. Yadav and Tiwari A., Environ. Sci. Process, Impacts, 2014, 16, 180. 107. V. O. Arief, K. Trilestari, J. Sunarso, N. Indraswati, S. Ismadji, W. Mandala, S. Catholic, W. Mandala and S. Catholic, Clean-Soil, Air, Water, 2008, 36, 937. 108. M. Diaconu, C. Smaranda, R. M. Hlihor and M. Gavrilescu, Bulletin of the Polytechnic Institute of Jassy, Section Chemistry and Chemical Engineering, 2013, LIX, 97. 109. S. Srivastava and I. S. Thakur, Environ. Technol., 2012, 33, 113. 110. M. Amini, H. Younesi and N. Bahramifar, Chemosphere, 2009, 75, 1483. 111. Y. Zhang, W. Liu, M. Xu, F. Zheng and M. Zhao, J. Hazard. Mater., 2010, 178, 1085. 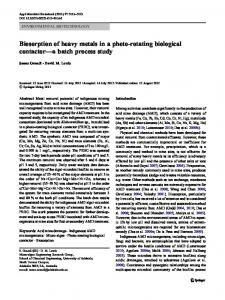 Report "recent advances in biosorption of heavy metals - Revue Roumaine de ..."